Children learn by doing. They learn the rules of social interaction when they are in an environment where they get to share and connect with other kids. They get most of their social cues from the adults surrounding them (or older siblings too). But they also benefit a lot from being around other kids their same age, as they are at similar stages of development: testing new sets of skills and figuring out how to play. Even if they play next to each other, instead of with one another, getting the interaction with other kids is how they begin to make friends. Therefore, more important than having music classes, gym classes, or doodle art classes, at this early stage in life playdates are profoundly important for toddler development. By having playdates with other toddlers (and their parents), your child will learn directly from you what you consider good and bad behavior when he or she is around other children. That is something your toddler can’t get from daycare, even if he or she is surrounded by other children — the most important element is missing: you. When my first daughter was a baby, she was at daycare full time as I was still working. With my second child, Tiny A, my husband and I decided for me to stay at home; financially speaking, that made the most sense for us. For my daughter, the interaction she got as a baby-toddler with other kids at daycare was priceless. But I also had a chance to meet other moms and forge friendships by having playdates after school. My son now has the input of an older sibling and her friends, but he needs to have his own space and his own friends. He needs to experience and learn what other little ones his age are doing… and also how to share with kids that want to play with his toys too. 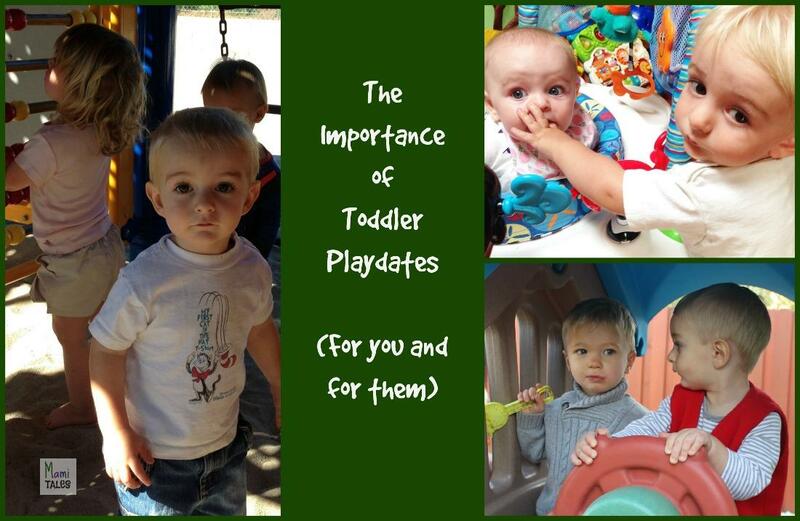 If you are a new mom… how do you arrange baby-toddler playdates? When my daughter was a baby, she started going to daycare when she was 7 months. Before that, I mainly spent the time at home — In love with my baby, but a little starved for adult interaction. I had gone to prenatal yoga classes all the way up to her birth, but never ended up striking a very close relationship with anyone… so I had no clue on how to go about finding other moms with kids. My work friends had no kids, or they had older kids. I literally was jumping all over my husband like a puppy as soon as the door opened at night, eager to use full sentences and have intelligible answers back. When my baby started going to daycare, we started having playdates with the kids she played the best with, and I made friends with some moms too. Now, with my second child, I’ve found a ton of other resources that I wish I had had when I first had my girl. Here in the US you can join your local Mom’s club chapter, to find other moms who live close to your house. It’s not only a great way to find other moms with kids around the same age, but also a fabulous network of companionship and support. Or if you’re lucky enough to have more friends who have children the same age, coordinate a group and see each other at least once a week. There are also many online resources to find groups of moms with similar interests, such as Meetup (to find people with similar interests to you, like fitness mommies or so), BabyCenter (to find people close to you with kids born the same month), Spanglish baby used to have a bilingual playgroup finder, or Outside the Box (for more structured activities that are… well, outside the box), to mention a few. While writing this article I even found an app for organizing playdates! The important thing is to keep both you and your new baby social, discovering a whole new group of people. And… what do you do during a playdate? Specially if they are babies! When they are very young, you can place them on the ground on blankets or jungle gyms to play side by side. As they become older, the mere fact of being in a new environment with toys they have never played with before is enough to keep them entertained for quite some time. As with any new environment, if you and your child are new to a group, it will take a little time for them to get used to the new dynamic. Just be gentle and play along with the other kids and moms to show your baby it is OK to play and be with everyone else. I know this one sounds crazy, but I think it is good to have a few good rules of interaction. It is never OK to hit. It is never OK to bite. Toddlers tend to be very possessive of their own toys, so it is best if you keep the most loved toys away and have plenty of “share” toys available for everyone else. If your child is sick, or you suspect he or she is coming down with something, please keep everyone else healthy and cancel with enough time. If you say you’re coming, please show up… or send a quick text message to your host to let her know you won’t be showing up and why. And finally, before you leave, help cleaning up. That also sends a very important message to your child about putting things away. Now that you know how important playdates are for both your baby-toddler and you too, find those groups and do it as a regular activity! Even if scheduling becomes hard because of napping times and such, do keep trying to get playdates. There are tons of resources on activities to do with babies and toddlers, so each playdate can become something exciting and fun for both of you. If you have any other resources or advice about this topic, please go ahead and share your thoughts in the comment section. And if you love to have playdates with your kids too, please share this information with other moms and moms to be! Tagged Baby, Baby products, Toddler.